Amazon.com offers the YI Mirror Dash Cam, Dual Dashboard Camera Recorder with Touch Screen, Front Rear View HD Camera, G Sensor, Reverse Monitor, Loop Recording for $63.99 via click "Save 20% extra coupon". Features: Two HD cameras including a front facing 1080p HD camera, and rear 720p HD camera. Easy to set-up, it fits comfortably over your existing rearview mirror. Integrated LCD 16:9 touchscreen for easy control and preview. 240mAh battery 3.7~4.3V（with NTC）; Operating temperature: 14F Degree - 140F Degree. 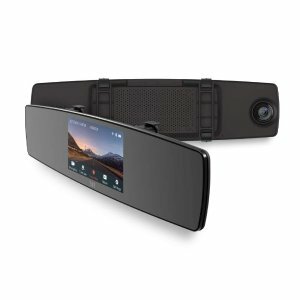 Built-in Wi-Fi for app connection **YI Mirror Dash Camera rear-view cabling is 6.5m (21.3ft).